Innovative ideas can save money when planning a wedding, and depending on how creative the idea is, the savings can be huge. For a relatively modest price, a Tahoe wedding on the highly sought after mountaintop Blue Sky Ceremony Terrace at Heavenly Mountain Resort can be achieved. The approach to the discounted rate is fairly straightforward, and a must see and do attraction in Lake Tahoe is the device that makes having an economical wedding a practical expectation. One of the top tourist attractions in Lake Tahoe during the summer season is Heavenly Mountain Resort’s gondola expedition. The gondola transcends heights of over 9,100 feet in the Sierra Nevada Mountain Range and reveals scenic panoramic views of the largest alpine lake in North America. Explorers will also see sights of Desolation Wilderness, the Carson Valley, and 72 miles of beautiful circumferential shoreline. The trip is truly a sightseer’s marvel, and for this reason the attraction can make the walk down the aisle of matrimony on Heavenly Mountain Resort’s Ceremony Terrace a very affordable one, and at a price brides and grooms will also marvel. The mode of transportation for weddings on the terrace is by means of the resort’s gondola. The Observation Deck, which is adjacent to the actual ceremony site, is a 14,000 square foot observation platform and is the first stop of a sightseeing journey. The mid-station allows visitors to stroll around for additional eye-catching views and photographing the amazing landscape or to perhaps grab a latte and keepsake. 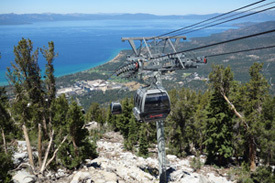 When the tour about the midway platform concludes, folks can once again climb aboard the gondola to advance to the top of Heavenly Mountain where more excitement awaits, including the Tamarack Express chairlift that can deliver even more picturesque, 360 degree views of Lake Tahoe. Arriving at the apex, tourists are exposed to successions of hiking trails from novice to expert in addition to a number of other activities that can be experienced, which the Heavenly resort varies throughout the summer. 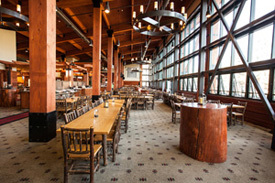 If a sedentary pursuit is desirable, one can simply relax in the sun while enjoying a favorite beverage or cocktail provided by the hilltop tavern or enjoy a meal at the Tamarack Lodge, which consists of a large food court with indoor and outdoor seating. Whatever the individual chooses to do, the adventure is well-worth the time spent and the ticket price charged for the gondola ride. Summer pricing for round trip gondola passage fluctuates, but is generally in the vicinity of $50 per person. Because the only mode of transportation to and from the wedding site on the mountaintop is via the Heavenly gondola, much of the cost for the offered Blue Sky Terrace wedding package is attributed to your guest’s travel to the terrace. Since your guests will have quite an adventure at their disposal and receiving more than they expected on your special day, a way to offset some of your expense of attaining the venue is to allocate the cost of transport to the wedding site (the gondola ride) to those attending your event. 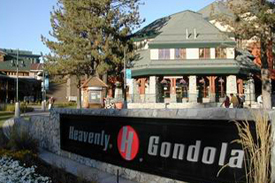 This is simply done by distributing the allotted gondola passes you’ll receive with your chosen package to each invited guest at the rate Heavenly Mountain Resort currently charges for the gondola ticket (or another amount that you deem appropriate). 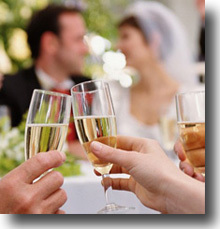 The result will be a huge money saver to the bride and groom, yet an insignificant outlay to the ones in attendance. 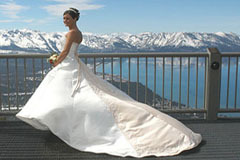 In essence, you can enjoy a savings of up to $2,500 on your mountaintop ceremony at Heavenly Resort by utilizing this technique in conjunction with the selection of our offered weekday or weekend terrace package. To vindicate the transference of a partial amount of expenses to invitees, keep in mind that people travel great distances to attend the wedding of loved ones, and most often they pay the tab themselves. Transportation up the mountain to the Blue Sky Terrace is only one other segment of their travel before arriving to their final destination, a place where they will share together with you on the most important day of your life. 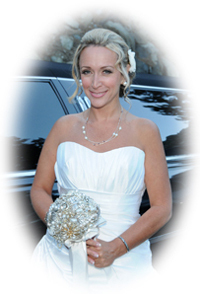 With such perspective while planning the event, immense savings can be achieved, allowing you to experience a mountaintop Tahoe wedding with a million dollar view at a very affordable price. See what others are saying about their experience on the summit by examining the many Heavenly Mountain Resort gondola ride reviews. You’ll see it is a “must experience” fun thing to do in Lake Tahoe. 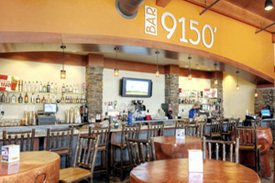 This entry was posted in Lake Tahoe Weddings, Prodigious Wedding Venues, Wedding Tips and Ideas. Bookmark the permalink.